The very next weekend after suffering in summer's intense sun, I was back on the trail with a full pack on my back, heading south on the PCT from Stevens Pass. The weekend's forecast had made a drastic change: cool with temps in the 50s and rain. Rain?! 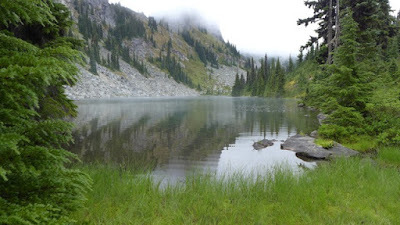 I had mixed feelings; I was grateful for the cool temps to hike in, but I didn't want to get cold, especially when swimming in the alpine lakes we were headed to. Angling up on the PCT that traverses the Stevens Pass Ski Area, we said goodbye to the last traces of sunshine and headed into cloud cover. At Lake Susan Jane, a lake I hadn't noticed on previous trips, I decided to go for a swim as we stopped for a lunch break. The water was relatively warm and I didn't feel cool as I exited and dried off with my minimalist towel. 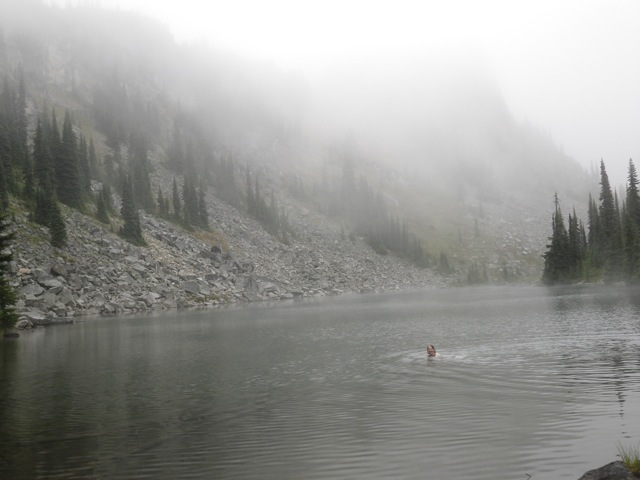 My fellow backpackers thought I was nuts, but that is the life of an Alpine Lakes Wilderness swimmer. 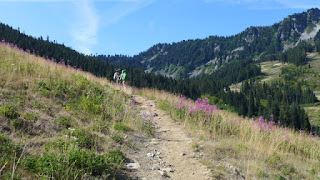 We passed Lake Josephine (swam in it in the past) and took the Icicle Creek Trail. So now I know that the headwaters of Icicle Creek are Josephine Lake – I love making this kind of connection in the geography. After some climbing and descending, we came to a small camp area beside the trail, the only one we had seen, and wondered how the seven of us, in our seven tents, were going to squeeze in. I offered to share my tent with a friend on the trip, but true to Mountaineers form, she chose to go single and we all managed to find suitable, if not creative, spaces for tents (including one hammock which definitely had the advantage in this scenario). During the night it rained and not a "light shower" that had been predicted, but long and hard and soaking. 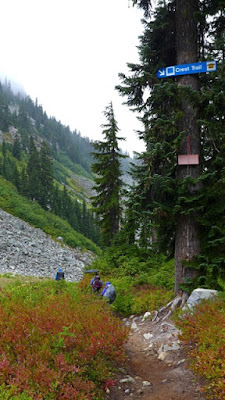 I stayed dry but was a bit leery about the day's trip up to Chain & Doelle Lakes. 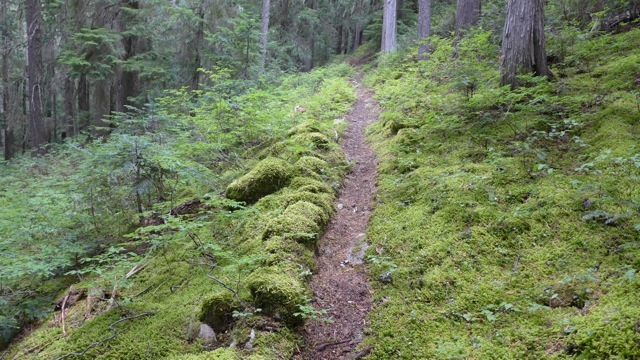 We started up the trail and it was a bit grueling: switchbacks followed by straight up sections, a couple of level spots and repeat. It reminded me of the trail to Spade Lake which climbs up from Lake Waptus. Even knowing I would never hike that trail again, I couldn't bring myself to get into the water. My quest to swim in every lake in the Alpine Lakes Wilderness that a trail goes to was going to have at least one blank spot. We made it to the lower of the Chain Lakes and I wasted no time to get into the water as my fellow hikers practiced patience, standing by in their rain jackets and gloves, keeping warm. When I emerged from the water, I got the post-swim rush that I used to get when swimming in Lake Washington in October; it must have something to do with the cold. My head was pleasantly dizzy and light and I had a feeling of euphoria. Or maybe that is my body's way of blocking out the pain. I was standing on a wet surface and realized I wouldn't be able to get my feet clean or dry before putting my boots back on. After everyone got their photos of the lake and fog and the maiden who dared swim in it, we headed for the upper lakes and to the trail to Doelle. I had most of my layers on at this point, including my hat and gloves and so when I felt the wind blowing through me and thought about the danger of hypothermia, especially after submerging into a lake at 6500', I bowed out of the final climb. Instead, I stayed at the lake and ate my lunch (which was woefully small), changed to dry socks (though my boots were already soaked) and hiked all the side trails I could find to stay warm. One member of the group, another swimmer, came back early to tell me that all I missed was more wind and cold and a peek-a-boo view of a lake a couple of hundred feet below. We started descending toward camp together until the clouds lifted a bit and he went in for a swim. That evening found a couple of us doing hill repeats on a beautiful, moss-covered section of the Icicle Creek Trail in order to warm up before getting into our sleeping bags. What a contrast from last weekend! The next day on the hike out, we were doing the rain jacket on/rain jacket off song-and-dance as we ascended, then descended a couple of times to the trailhead. The drive home was through a deluge and we all felt better knowing we had not missed much in the way of sunshine. 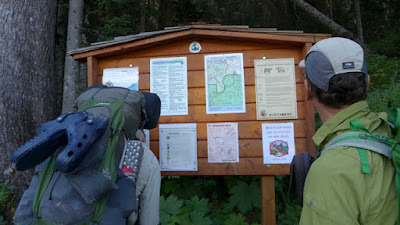 And one of us had crossed off another lake or two on our list.